Recently the new 2016 Hyundai Tucson was released and is expected to be a best-seller in the SUV market which currently shows no signs of slowing in demand. Hyundai’s Tucson is a top contender with a composed drive, supple ride, expansive cabin space and advanced safety features. Looking at the 1.7-litre diesel version which kicks out 116bhp, paired with a six-speed gearbox is expected to be the best-selling engine. It has some parts taken from the older ix35 although Hyundai have tweaked the engine to comply with Euro6 emission standards. This makes the car perfect for a family vehicle with low CO2 emissions of 119g/km and a combined 61.4mpg. Other engine options include two 1.6-litre petrol engines at 132bhp or 177bhp and two 2.0-litre diesel engines at either 136bhp or 185bhp. If you are looking for all-wheel drive, you’ll be looking for 2.0-litre models. Take a look inside and you will see a nicely uncluttered dashboard and a full panaramic sunroof adding to the sense of space and adventure. You’ll have no problem fitting in any large objects into the boot which has enormous potential serving up 513 litres of space. Fold the rear seats and prepare to be amazed by the 1,503 litres of space leaving all the competitors in the dust. The taller body and longer wheel base provides plenty of room for three adults to be seated in the back. 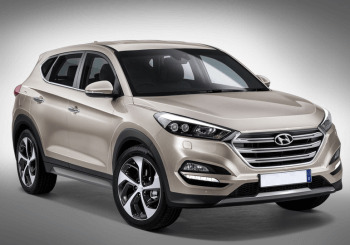 The Tucson has taken a more curvaceous and softer shape than its Santa Fe sibling adapting the striking front grille and strong rising shoulder lines. Around the side, heads will turn to the very eye-catching 16-19 inch alloy wheels. 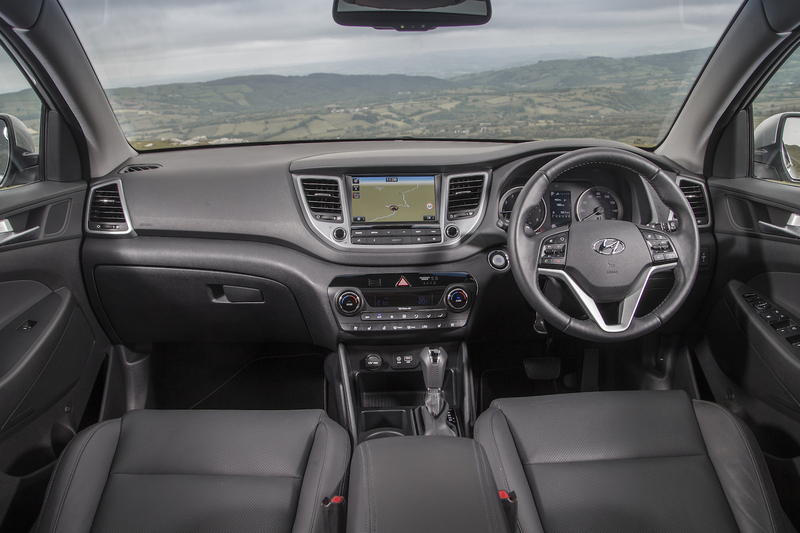 It is not the most subtle crossover model out there however both the exterior and interior features of the Tucson show a high level of craftsmanship from Hyundai. The Tucson has an array of state-of-the-art safety features including AEB, BSD (available on Premium & Premium SE trims) LKAS and SCL (are available on SE trims and above). Autonomous Emergency Braking (AEB) scans the area ahead for vehicles and pedestrians automatically braking if a collision could occur. Blind Spot Detection (BSD) warns you of any vehicles or objects in your blind spot. Lane Keep Assist (LKAS) alerts you when crossing a lane without signalling and Static Cornering Lights (SCL) makes cornering in darkness much safer by guiding a beam of light in the direction you want to travel. You’ll role down the road in the Tucson feeling very much in control as the 270Nm of torque from the 1.7 diesel engine helps you maintain speed combined with exceptionally smooth springs and dampers absorbing all those bumps in the rugged tarmac. The Tucson’s stiffened body structure provides neater body control along with direct steering it is very manoeuvrable in town and around bends on the open road. Like what you see? Take a trip to our Howards Hyundai Yeovil Dealership to test drive the new Hyundai Tucson. Back in the spring, the new Hyundai Tucson SUV debuted at the Geneva Motor Show. Hyundai has now announced that the car will go on sale in the UK this September. The Tucson will replace the current ix35, and it’s wider, lower and longer than its predecessor. Hyundai shunted the name Tucson into retirement five years ago, but has resurrected it with a view to creating a more universal product with the new Tucson. "We made the decision to have the same name for global products worldwide," said Hyundai Europe's Chief Operating Officer Thomas Schmid. "Almost everywhere called the car the Tucson apart from Europe, but our studies showed that awareness of the name among customers was no different. "It gives us a synergy around the world that brings advantages – and it allows us to signify the significant step forward in the product and the design that we have made with this car. It's our belief that Tucson will lift perception to a new level among customers, who have not seen this level of quality or craftsmanship from us before." The new Hyundai Tucson is more rugged than its predecessor and comes with the brand’s signature prominent front grille. It takes some design lines from its big brother, the Hyundai Santa Fe. Hyundai Head of Design Peter Schreyer said: "We tried to make an SUV, but make it bolder and stronger. When we do something like this, of course, we have in mind that it needs to be successful globally. It needs to be a good product and then it can be successful in all markets." In a clear rival for the Nissan Qashqai, Tucson buyers will get a choice of two petrol and three diesel engines. All the units will be Euro 6-compliant. The 1.6-litre petrol comes in both turbo and naturally aspirated guises and you have a choice of 133bhp or 174bhp. Diesel-wise, a 1.7-litre engine kicks out 113bhp, while there are two 2.0-litre options, in either 134bhp or 181bhp. If you want all-wheel drive, you’ll need the 2.0-litre model. Back in Geneva, we saw some hybrid engine options, but Hyundai has yet to confirm one for the new range. The new Tucson will be constructed on the same platform as the new Kia Sportage. This makes it fairly spacious, with a 513-litre load capacity that trumps the Qashqai by 83 litres. Seats are ventilated and heated, that tailgate is powered, park assist and powerful new satnav systems make life more comfortable for drivers. It’s packed with safety features, such as autonomous emergency braking and rear traffic alert and the car is expected to be competitively priced, although dearer than the ix35, which kicks off at £17,000. To test drive the Hyundai Tucson in the south west of England, get down to Howards Group authorised Hyundai showrooms in Yeovil soon.